The refreshed Model S was scarcely acknowledged by Tesla, but appeared on their website about two weeks ago. The upgraded car will likely get further features phased in but already makes a pretty significant step up from the prior version. 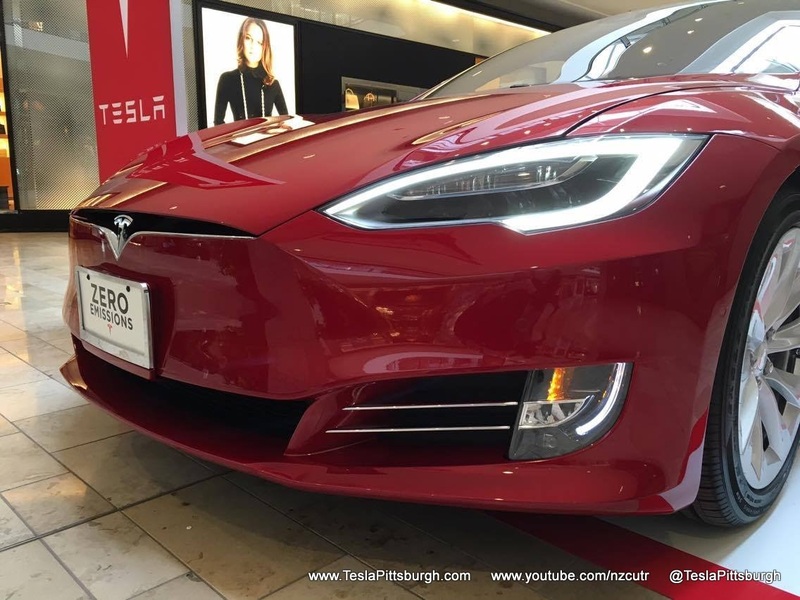 Most of the changes appear to be all about appearances, bringing the styling of the Model S more in line with the Model X and Model 3 prototype. Jalopnik was just one of many websites that reacted favorably to the new styling. The Tesla owner community seems more split, but despite some "Classic" owners claiming to have a stronger affection for their nose-coned cars, I believe the majority feel like my friend Jake. 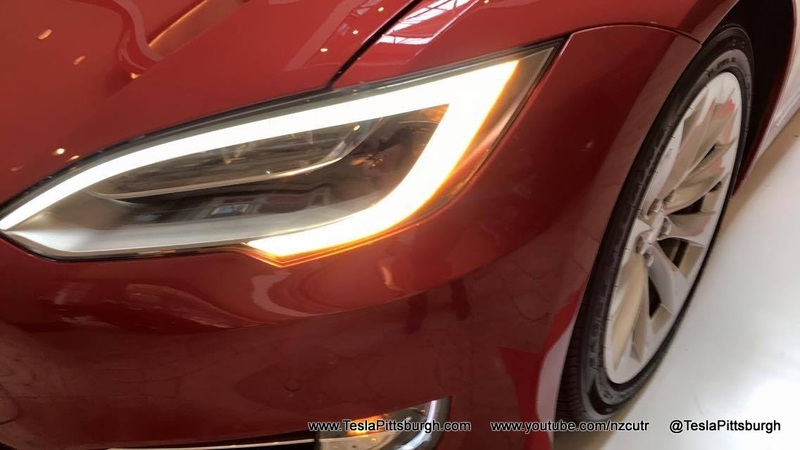 He took most of the pictures you see here and summarized his impression of the car, in the flesh, like this: "Looks stunning enough to make me want to trade in my classic 2012 Model S."
Indeed, the new headlight assemblies are just gorgeously rendered. 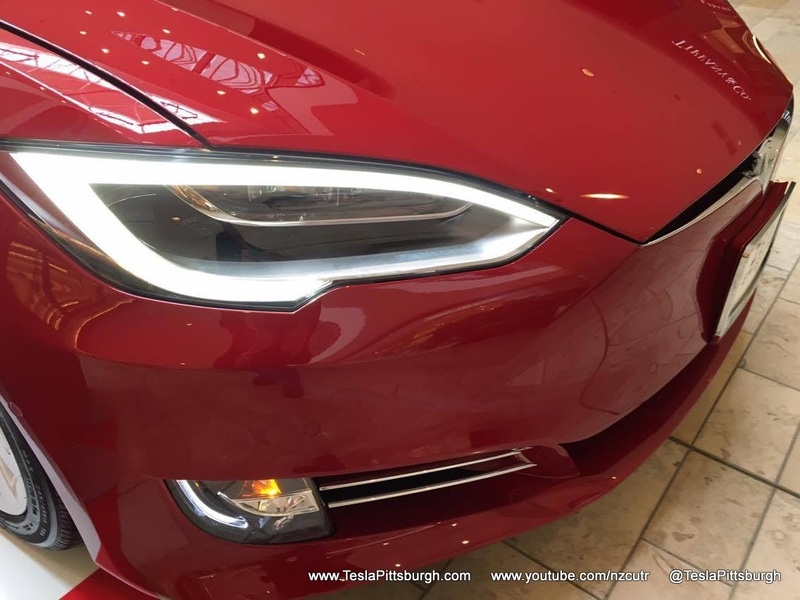 While they lose the anthropomorphic "eye contact" of the round HID headlights, they are so seamlessly lit as to look otherworldly. I first noticed this on the Model X and am glad that the glowing DRLs have been adapted to the Model S. The turn signals are not integrated into the DRL portion of the part and-- though it may be hard to see in these pictures-- the effect is immensely classy. Nice touch. A lot of speculation has been focused on the front license plate bracket. According to various reports, all cars are mandated by the DOT to ship with the bracket in place-- so everyone will take delivery with one. Concerns about extra mounting holes in the otherwise clean fascia can be laid to rest. It turns out that Tesla has used two vertical bolts that skewer up into the inside lip of the lower opening. The top edge of the frame is then held on with two-sided automotive tape. 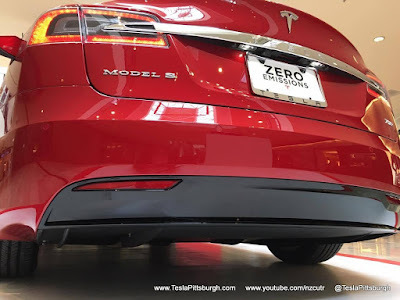 The result is that owners in states that do not require a front plate can remove the bracket and all associated hardware after delivery and have no holes or other defacement of their Model S. Very clever. 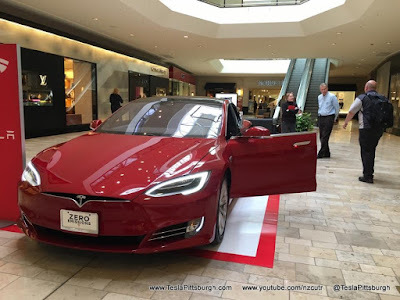 The Slipstream wheels we wrote about in March were on the Ross Park car and... I'd say my feelings are still pretty mixed about them. The flattened face of the wheel lacks the sculptural depth of the Tesla Turbines (and their aftermarket TSportline TST counterparts) and the Tesla Cyclones... which I fully expect will soon be discontinued or a no-cost option because their price is no longer justifiable. RIP 5-spoke 19" wheels.... RIP. 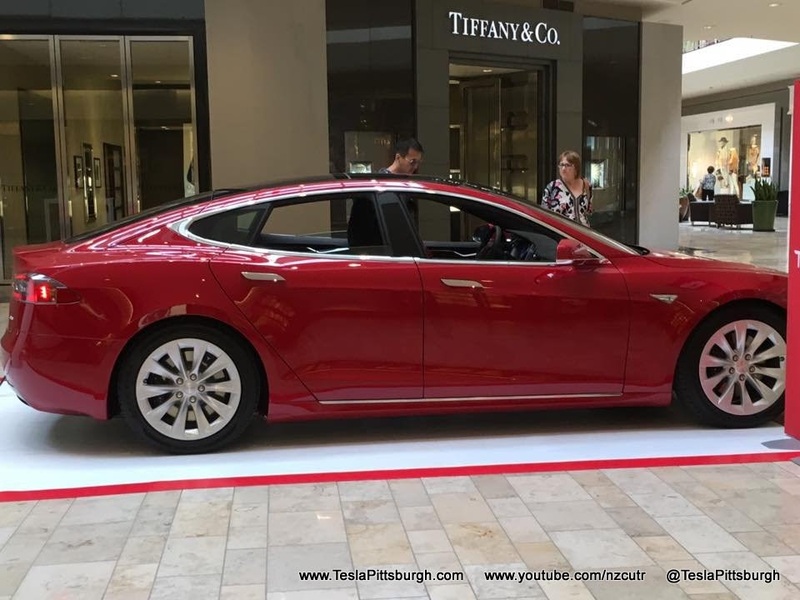 My assessment-- though I've yet to see the car in person-- is that Tesla has done a great job overall in updating the car without scandalizing it's classic proportions. 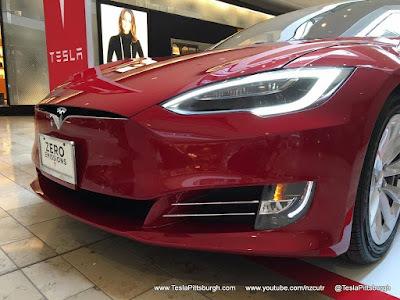 I think that the Classic look is pretty timeless but that the design language of the grill-less Tesla will also age well. There aren't a lot of criticisms, but I do have a few-- let's call them suggestions. 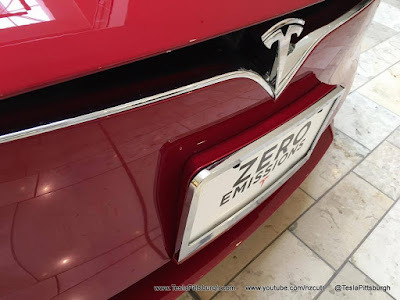 Tesla has always emphasized safety but despite modestly revamping the taillight assemblies they still-- STILL-- don't have amber turn signals. 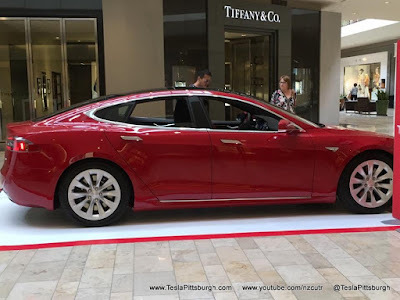 I'm sure there is some regulatory reason, but not only would amber rear turn signals be more safe (especially given the sometimes confusing regenerative-braking activated brake lights) they would also allow Tesla to make just ONE version of the parts for domestic and export markets. 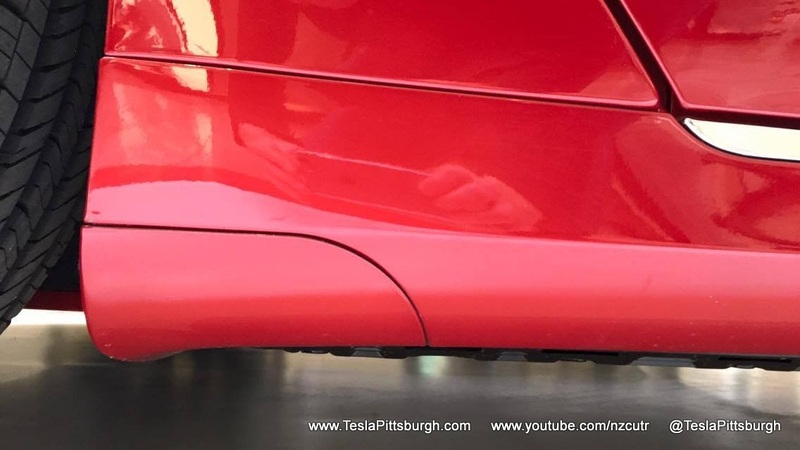 Tesla has decided to paint the rocker panels going forward. This alleviates one of my major-- admittedly OCD-- issues with lighter colored cars. 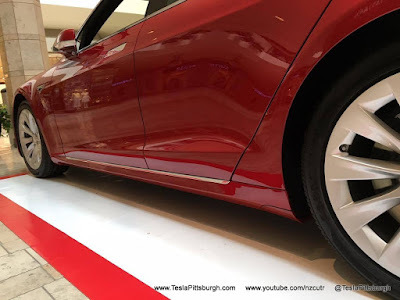 We considered choosing silver paint for our car but I couldn't get over the fact that, when combined with the chrome strip under the doors, the visual effect was that the doors were too long and didn't fit properly. From about 10 feet away I still get this impression with white cars too. The painted rockers will end that visual trick but also give those lighter colors a lot more heft and weight around the middle. I think it looks like the car has been to a few too many buffets. Medium and darker colors fare better though and the painted rockers definitely bring the visuals more in line with the price. However, I do have to wonder about durability as the rocker panels get absolutely POUNDED by debris. Even if you had been only thinking about minimal paint protection film on the hood and nose, the rocker panels should be on your to-do list now. The rear diffuser's glossy paint has me a bit confused too. 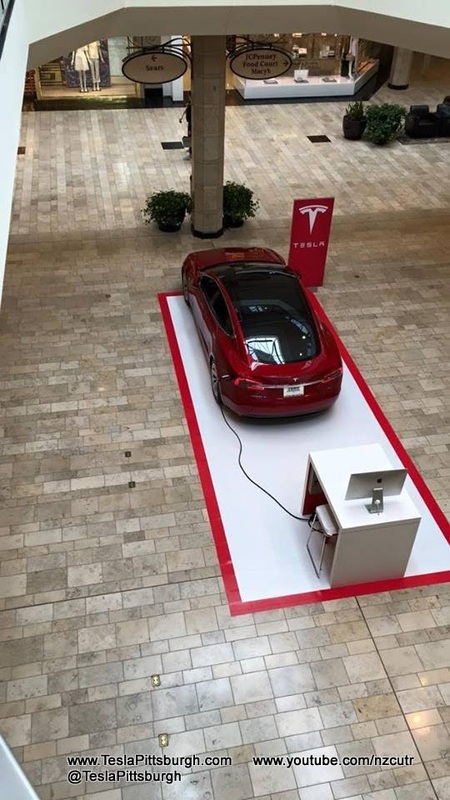 I suspect there may be some in the company who wanted to shine up the surface because, smugly, a Tesla won't be smudging it up with exhaust gases. It'll still get plenty dirty though and now every tumbling piece of road debris can mar yet another finished surface. I'll grant that the flat plastic of the prior style might not be swaggerific enough for a car of this price range, but I liked the chromed fins lurking out from down below. Of course there were improvements inside the car too. The Bio-weapon Defense Mode is nice but seems to have come at a hefty cost to the frunk-- even beyond what the dual motor versions ate up. One of the selling points used to be the large frunk but that is now just a memory for the Model S unless you're getting a barebones 70. 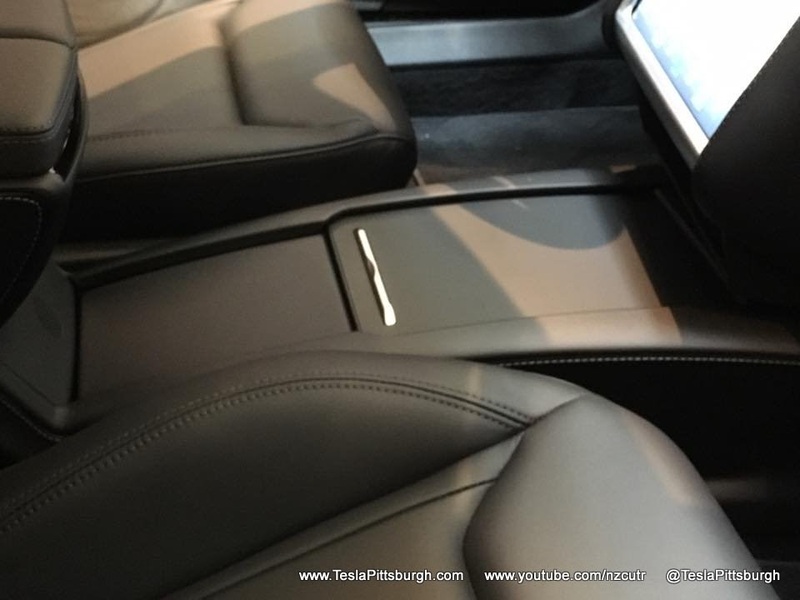 Tesla has also made the center console standard instead of an optional add-on insert. The new console is molded as part of the main structure of that part and not removable. I'm not sure where my wife would put her purse or where I'd toss my Canon SLR when we roadtrip... Not in agreement with Tesla on the decision to mandate a console there just like every other car. I like that we can use the open space to hold things that would otherwise be tangled around the front passenger's feet. 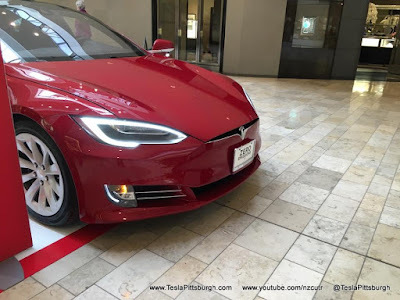 Most notably, in addition to now offering the blue paint I always wanted, Tesla now offers the dash wood I was wishing for. I can't wait to see the "Figured Ash" in person, on a beige interior. The base gloss piano black trim is gone now too, in favor of a slightly more interesting "Dark Ash." 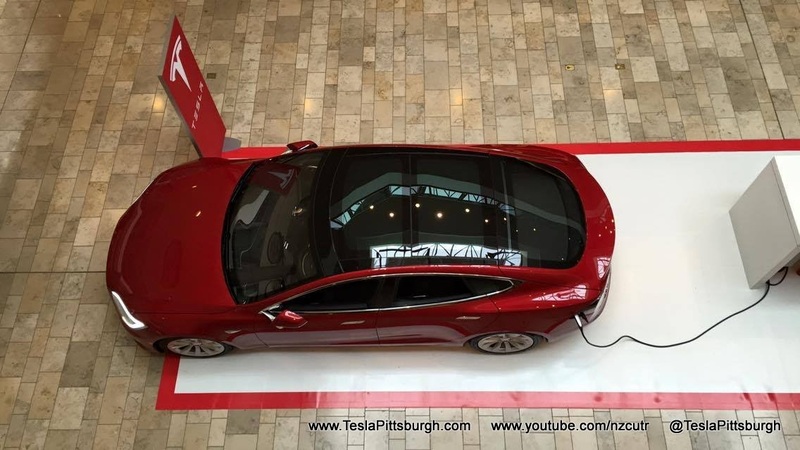 Lastly, it looks like Tesla has solved the ONE complaint I really have about my car: the hood sticks up too far. <Sigh> I know it's a #firstworldproblem but if you compare the gap between my car's hood and the front grill versus the ones built after they changed assembly lines, you can't help but see how much tighter the fit became. 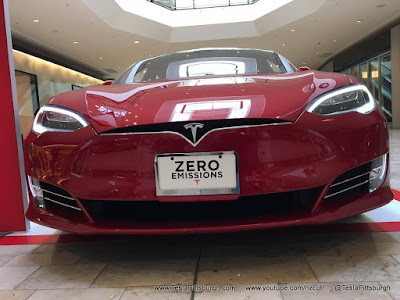 The new nose lacks that upper portion of the grill so even THAT variation in assembly quality is now completely gone. The gap can vary quite a bit before it ever raises an eyebrow! If you want to know more about the new car you are encouraged to visit the team at Ross Park Mall or visit the Tesla website.